The Kentucky senator tells TheStreet how he will cut $500 billion in spending in one year, and why he's calling for a non-confidence vote for the Treasury secretary. 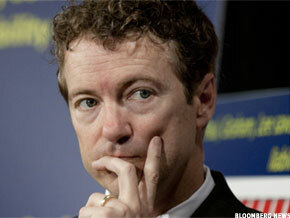 NEW YORK ( TheStreet) -- Sen. Rand Paul (R., Ky.) assumed his seat in 2011 and instantly targeted hot-button issues. His first proposed legislation in the U.S. Senate called for a $500 billion cut in federal spending in one year. The senator said that when he suggested the cut, most people in Washington said they couldn't imagine slashing that much in a year. But in his home Bluegrass State, people complained that he hadn't gone far enough. Paul called for a vote of no confidence earlier this month in Treasury Secretary Timothy Geithner, in the U.S. Senate. Paul said it was interesting because there was "essentially" a no-confidence vote once before in 1915, but that he didn't have much luck because Senate Majority Leader Harry Reid wasn't interested in having the vote. "Essentially, I think the stock market has already given a vote of no confidence to Geithner and to President Barack Obama," Paul said in an interview at TheStreet's New York headquarters. "I really think we're living in a failed presidency at this point, because everyone who can vote by investing is not investing." Paul spoke about the "Penny Plan" he recently proposed that would cut 1% of spending each year for six years and then freeze spending, which he said would balance the budget in eight years. "Most people -- like right now when they say they are going to cut $2 trillion with this new debt-ceiling plan -- they're cutting proposed increases, they're cutting against a baseline that goes up 7% a year," Paul said. "I'm talking about cutting 1% against -- if we spend $3.8 trillion, we cut $38 billion." Paul also noted various businesses that he said had been "winners" and "losers" during the Obama administration's tenure. He specifically criticized waivers that had been given out by the administration linked to "Obamacare." "I think any law that gives 3 million waivers, there might be a problem with the law." He mentioned that more than half the waivers have gone to unions, and insurance companies also received them. Paul said that he did not have a problem with all the waivers, but he questioned how it was determined who was granted them. He cited a case in which McDonald's ( MCD - Get Report) received a waiver, but competitor Burger King didn't. When asked whom he would choose other than father Rep. Ron Paul (R., Texas) for the Republican Party's presidential nomination, Paul declined to select. "Oh, you know, I'm refusing to answer the second-choice question," Paul said.